all the projects are gorgeous! I have been intregued by fellow crafters and their water coloring, the results are so beautiful. I have been researching different ones and was excited to find out you now hove some!! Amazing results with these markers! Beautiful! Beautiful colors. Can’t wait to hop along and see all the beautiful cards. Oh what beautiful new colors! Amazing inspiration projects! Wow! Altenew’s newest water brush markers look amazing! I can’t wait to try them! So many beautiful projects have been created with these cards! Altenew has another hit! Way to go! These are a dream come true! Such a help to us crafters! Thank you, Altenew! These colours are gorgeous, and the cards are fabulous! Beautiful colors! I love the projects. Loving the new markers! They look amazing! Oh what beautiful colors! These are great tools. Wonderful new set of watercolor markers! Beautiful colors and I love how the designer showcased them in these gorgeous projects. 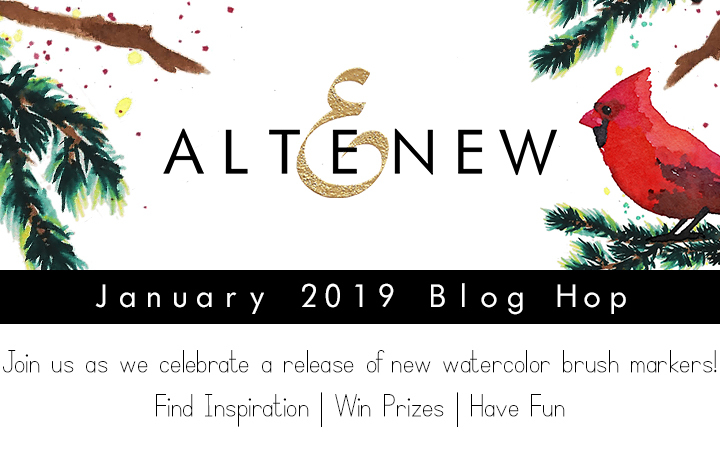 The Altenew Winter Wonderland Watercolor brush markers make creativity look easy! However the artist show case looks exquisite & I know a great deal of work went into all of the designs! Beautiful designs with a excellent use of the markers! Everything is so wonderful, but how great are those markers? AWESOME! Beautiful projects and love seeing everyone use these new watercolour markers. I love markers but I am getting a little upset with them. I have some fabric markers & I stamped a mandala on a tee shirt for my sister & wanted to color it in.The cap of the yellow was bright but when I used it, it was more of a yellow green & more green then yellow. Definitely not the color of the pen or cap. Another time I wanted a bright almost bubble gum pink pen. The pen was black on the outside but the cap was the pink I wanted. When I got it home, the color was not the bright pink of the cap. I know you guys though & I’ll bet your pens are the best! I can’t wait to see what everyone has created with them & when I win, I want those pens so I can get my groove on & get really creative! They will make my art work look so amazing! Watercolor markers are easy to use and the bright colors really enhance the look of my cards. The new colors are great to see. Thanks so much for providing them on your site. Thanks for sharing such talent. Always some new ideas to try. Nice. Great job with those markers. So much fun to see all the beautiful projects! These markers look amazing, such beautiful and vibrant colors! I love Altenew products! I’ve been holding off on watercolor brushes for so long but I think I’m about to cave with this release! Wow! Gorgeous colors! And amazing projects! The projects really showcase the versatility of the Watercolour brushes and the tips are inspiring. I’ll certainly be using them for my projects. The projects are all so beautiful. These markers look like the perfect way to get professional results. The colors are gorgeous, especially for stamps/images like the cardinal on the package. Your team always has such wonderful projects ith each new product. Thanks for being so generous! I can’t wait to try these markers out! Just ordered my markers….can’t wait to get them! These are awesome. I will definitely purcha sing. The colors in this set are really nice and rich, and the addition of silver is great! I haven’t used watercolor pens yet. I may have to try. The colors are beautiful. Yay more watercolor brush markers, I’m so excited to get these in my hands and create! Thanks Altenew! Very anxious to try these markers! Love the colors. These colors are just beautiful. What a great new set. Thanks for the chance to win. The colors are vibrant and so alive. Love these, especially the heart design. I wish I could afford the markers because they look awesome. Unfortunately, I am facing surgery without sick time so I have to scrimp right now. I love Altenew and think it is a high class business. I love every product I have purchased. Your storage sleeves are the best out there. Thanks for the free layering class I’m looking forward to. I’m sure I will want to buy more once I fill comfortable with your stamps I already have ! What a fabulous new product, colouring is always difficult but these pens make it look a piece of cake. What a wonderful new product! Looks these pens will take watercoloring to a new level plus they look so easy to use. All the colors look yummy and I can’t wait to try them. Such beautiful vibrant colors!! I love watercolors! I can’t wait to try them! Love those new watercolor markers! Hi, I am having a lot of fun with my new painted flowers stamps and die set and the many ideas I’ve found on your website and pinterest. I’m thinking about trying the watercolor pens now. Thanks. I love the samples you showed using the watercolor markers. I really want to try these new pens to see if I can color some of your beautiful image stamps with them. I love these colors!! They’re so beautiful!! I just bought all the sets of markers and I’m loving the fact that they all blend so easily! !